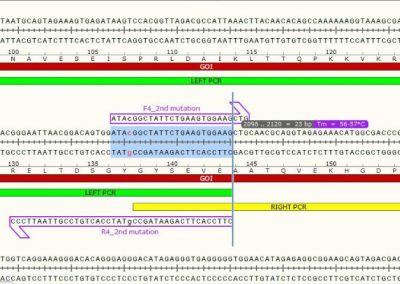 In vitro digestion of the template DNA. 90% of clones contain the desired mutation. Suitable for insertions of ∼ 80 bases or longer if using oligos > 60-mers. Ideal for creating large deletions. 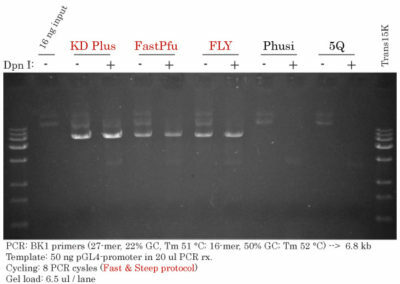 Long PCR protocol – 25 cycles (between 4 and 8 hours or 1 to 2 hours using Fast & Steep PCR). 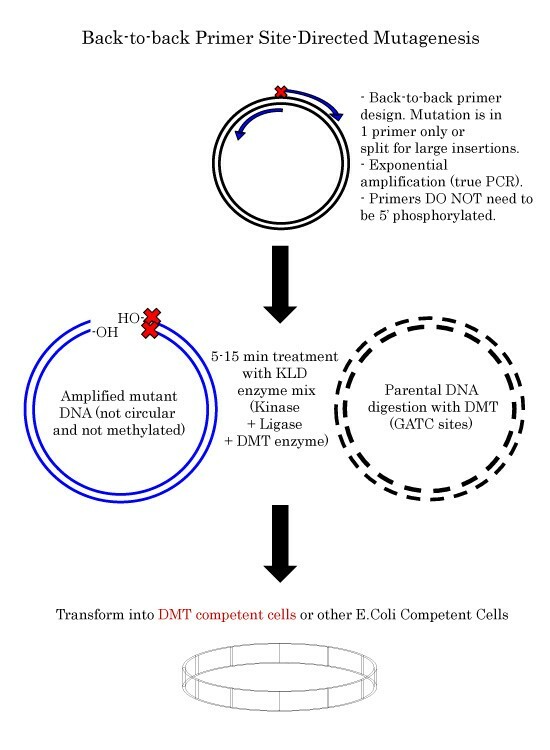 Only 1 primer contains the mutation which may generate non-methylated and non-mutated PCR products. 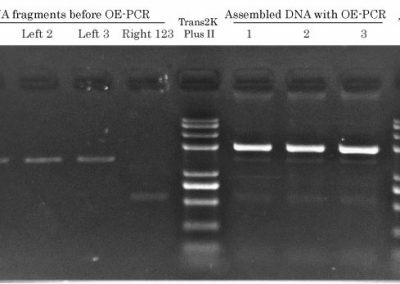 Primers or Dpn I-generated fragments are likely to be inserted at the ligation site. 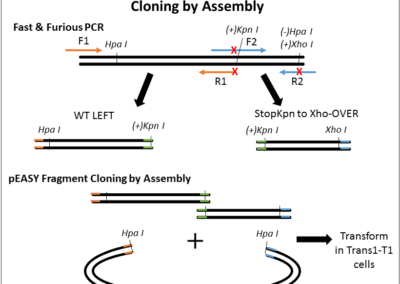 ***To ensure that no extra mutations are introduced in the vector backbone, site-directed mutagenesis strategies, such as the herein KLD strategy, which use whole vector amplification require subcloning of the sequenced insert into a vector that hasn’t been amplified by PCR. Alternatively, the whole vector can be sequenced. 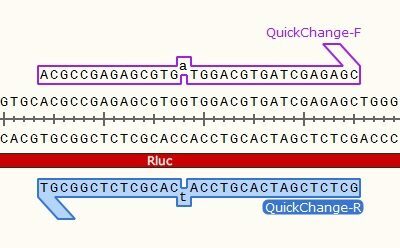 As in the name of the technique and in contrast to QuickChange and Fast Mutagenesis primer design, both primers must be designed ‘back-to-back’ in opposite directions. 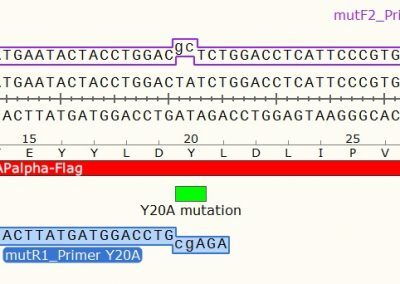 Only one (1) of the primers must contain the desired point mutation. The back-to-back primer design allows for deletions of unlimited size to be generated simply by positioning both 5′ ends of forward and reverse primers directly on the sequence flanking the desired deletion. Both primers must be designed ‘back-to-back’ in opposite directions and either one of them must contain the sequence to be inserted on its 5′ end. The insertion can be split between both forward and reverse primers if desired. Want to go Faster and Save Time? 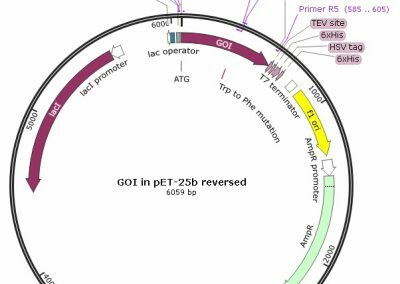 Use the Fast & Steep PCR protocol for whole vector amplification (WVA) to limit the number of PCR cycles to a minimum and achieve high-yield PCR. The risk of introducing undesired mutations drops drastically by at least 100 000-fold. + 1 ul of KLD mix at RT for 5-15 min. Incubate at room temperature for 5-15 min. Add 1-2 ul of the KLD reaction from Step 3 and gently flick the tube 3 times before incubating on ice for 30 min. Heat shock the cells by at precisely 42 °C for 30-45 s (depends on the cells). Spread 50-200 ul on a prewarmed LB-agar plate containing the appropriate antibiotic(s). Add 1-5 μl of the KLD reaction to 50 μl of DMT chemically competent cells (CD511). • Incubate on ice for 30 minutes. • Heat shock at 42°C for 45 seconds. • Incubate on ice for 2 minutes. • Add 450 μl SOC or LB, gently shake at 37°C for 1 hour.